Ever hate when you're visiting a new city and have no idea where to go? I'll share the good, bad, and places of concoction heaven! Hotel Palomar, a signature Kimpton hotel is now open right in downtown Phoenix. Near the convention center, Cardinals stadium, and other great hotels and restaurants, this little slice of downtown is a great destination for tourists. Today, however, the hotel is open but still being built. What is surprising is that your rooftop bar getaway shows no signs or surroundings of construction progress making it a fun destination. As you walk into the hotel, take the elevator to the third floor where Lustre is attached to the pool area. Surrounded by cadanas, there is plenty of places to sit and misters to keep you cool. The bar is actually around a wooden wall on the left side of the pool. The area is full of ample couches, bar tables, and seats. What made it a bit less traditional was the attire of your staff - neon tennis gear. Girls had on full skorts with bright yellow shoes and guys had on graphic shirts with sweatbands and neon tennis shoes. Fun little detail to add to the outdoor experience. For those looking for happy hour, Lustre hosts you from 3-6pm for drinks at $6 each. Their list includes some fun recipes from the Pisco Cobbler with Pisco (a viscous clear brandy), pomegranate, blueberry, and mint to a cucumber cooler served in a martini glass. I wasn't enamored with any specific recipe here, but I did enjoy their prickly pear if you are looking for a suggestion. If food is of interest, the lavendar feta chunks were fun as well as their tomato flatbread. I suggest heading to their full restaurant the Blue Hound downstairs if you are truly hungry for a much larger selection of delectable menu items. Gibson's ..... psst what's the magic word? On my last trip to Washington D.C. my fellow blogger, co-worker, and travel fashionista took me to a Speakeasy around Dupont Circle. As we all know speakeasys were originally created to provide a safe haven to drinkers during prohibition times and required patrons to whisper or "speak easy." Typically they had a non-marked door and required a password. Now when I think about speakeasys today, I always love the ones that still require a password or keep some of the traditional themes at play. The Gibson may not require you to dress up in a flapper dress, but they keep some of the original traditions alive. Tucked next door to Marvin, a wonderful restaurant in D.C. run by the same owner, The Gibson still has a black unmarked door. As you walk in, you walk into a stairwell where a kind gentleman checks ID. He then opens another unmarked door on the left and escorts you into your secret hideaway. The dim candlelit room stretched back fairly far and included many tables of people (reservations needed for these!). Dana and I chose a cozy corner seat at the bar and looked at their extensive menu of unique concoctions that apparently change seasonally. I have included an example of a menu from a fellow traveller Adam Jackson since it was too dark for my photo to look good! The mixologist was wonderful at choosing drinks that suited our palette and preference. I must say, I was very impressed and if you're up for an adventure, The Gibson is the place to go! P.O.V. - W Hotel Washington D.C. When I think about the most extravagant rooftop bars, I think of skyscrapers hosting open air views. P.O.V. in Washington D.C., however, offers a unique exception. 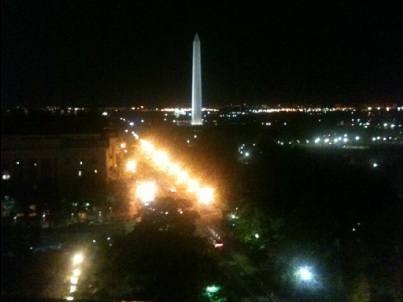 Overlooking The White House, the Treasury, and the Washington Memorial, P.O.V. gives you a one of a kind breathtaking view of some of the most recognizable structures in the D.C. area under a covered awning on the 11th floor. Before elaborating about the bar, I want to provide a little history of this historic building. The Hotel Washington was built in 1917 across the street from the White House and the Treasury. The hotel has hosted politicians, presidents, celebrities, CEOs, and many other famous individuals. Several movies including the Godfather Part II were filmed on the rooftop. 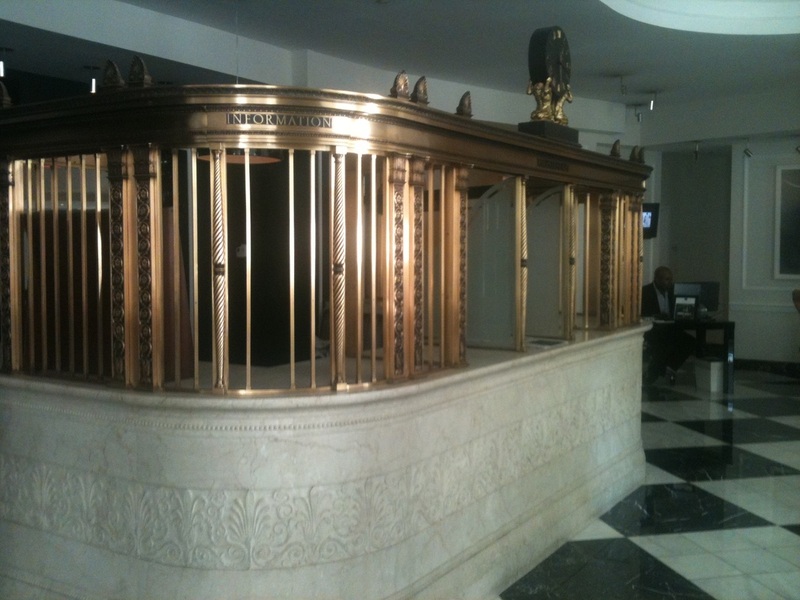 a substantial area of the lobby preserving the history and character of the hotel. To make it more modern, they have added red chandeliers and LED purple lighting throughout the lobby bar and seating areas. And the experience doesn't stop there. From the moment you walk in staff are smiling, welcoming and ready to help wherever possible. The W protrudes hospitality and warmth from almost every staff member we encountered making the entire experience enjoyable. Now on to the reason for this entire post: the P.O.V. rooftop bar. We went to enjoy this area for two separate occasions: 1. to complete some work while witnessing breathtaking views 2. to enjoy the wonderful weather. As for the views, I've already stated that you can see the White House, Treasury, and Washington Monument. Being so close to the White House, you can actually see the security monitoring the roof and walking around the grounds. In the evening the bar also opens a second glassed-in room that serves as a dance club playing modern dance hits. For those who prefer mingling to classic rock tunes, the open air bar would be a better choice. Foodie and lover of adventure. I travel substantially for work and love to share amazing or unique hidden gems along the way!.